A team of final year students from Teesside University are making waves around the world after they developed a deep sea exploration game for a cutting-edge gaming device. The students, who are studying courses in the School of Computing, pooled together their varied expertise to create UnderCurrent for the Oculus Rift virtual reality headset. Oculus Rift is a head mounted display which is revolutionising the way video games are played. Recognising the strange delights that lurk in the depths, the 14-strong team set about building the under-the-sea exploration game specifically for the Oculus Rift. 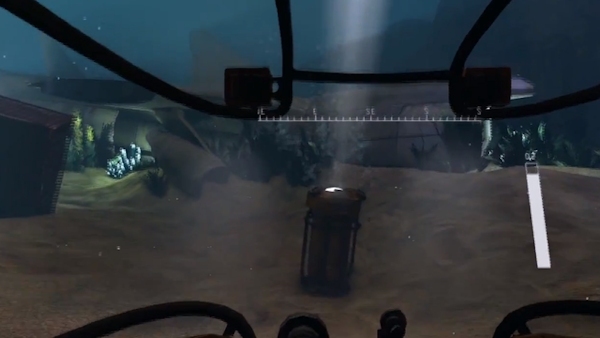 It immerses the player in the underwater world and tracks head movements so that they can experience the deep sea in a natural way. Three levels have been assembled so far which all take place in the iron graveyard of the Bermuda Triangle. The feedback has been overwhelmingly positive and UnderCurrent has already received press coverage in France and Holland, mentions on countless gaming blogs and websites, a news feature on NBC and 10,000 YouTube views in four days. All of this has given the UnderCurrent team a platform to develop their game further and get it ready to release. Christian Frausig, who is one of the designers, said the game was originally developed as part of a final year group project. He added: “Virtual reality has the ability to take us places we can only dream of. The ocean is a perfect example of a real location that we all know of, but know very little about. Christian, who is studying BA (Hons) Computer Games Design, is looking forward to the challenge of producing a game for the high profile Oculus Rift, which is at the cutting-edge of virtual reality technology.